I firmly believe that you control you. You are responsible for what you see in the mirror each and every day. That being said, I am a realist. Not everyone knows how to initiate physical change. Not everyone has a firm grasp on the building blocks of exercise and nutrition. Not everyone has an easy time staying motivated and setting positive goals for growth. There are obstacles that stand in the way of the ideal you. Relentless TV is here to empower you. Its aim is to provide all the knowledge that you need to transform your body; it is equal parts exercise, nutrition, motivation, and ambition. Professionally I am a personal fitness trainer and lifestyle and weight management consultant. 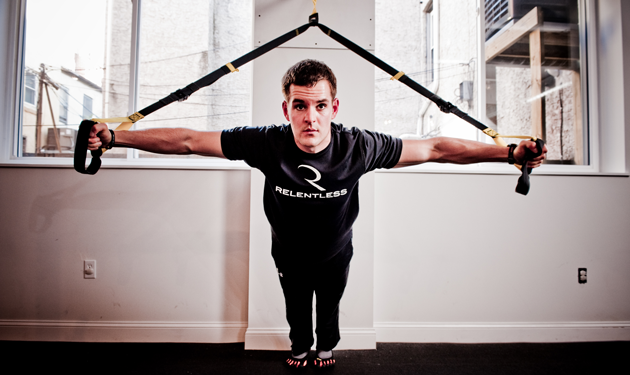 My daily passion is running Relentless Fitness, my Philadelphia based personal training studio. My fitness background is not exactly what you’d call traditional, with a career that began in finance as a bond trader. What can I say? I didn’t like the desk or the lifestyle. A major career move later, I was training friends, moving up the ranks at a local gym, branding Relentless Fitness, and moving it to its current studio home. The unorthodox background gives me several advantages. I am here because I want to be; this is my passion. I can better relate to anyone out there dealing with the stresses of everyday life and desiring change. My analytical side assures that I will never stop learning, growing, and getting better – for myself and naturally for you as well. Personally I am aggressive by nature; I love a challenge. Tell me I can’t, and I will say I can, I will, I must. The more pressure the better. A year ago I developed a habit. I created a lengthy list of fitness focused blogs and every single day I read anything new that they had to offer. I then selected a handful of my favorite posts and listed them on my blog (with proper credit of course) as ‘Daily Fuel’. A funny thing happened. Daily Fuel was no longer enough. It was time to create my own content and my own form of expression. As a trainer I am fascinated with positive change and transformation. Naturally I created the Relentless Transformation program, a time-bound challenge designed to take clients to the next level through proper exercise, nutrition, and mentality. Thus far some of their results have been stunning. The fact is that my training time is limited. There are only so many hours in the day. I can reach a finite number of clients through my studio. That is unacceptable to me. Relentless TV is my channel of communication to reach you and anyone else interested in changing themselves for the better. Relentless TV is your channel of communication to reach me and get involved in the experience.